If you've visited this blog before you'll know that the diminutive Mrs Blog and I spend six months of the year in Africa and six months back in Australia. On an average trip we’ll spend two to three months in the Kruger National Park. The wildlife is great here (where I am right now), the camp sites have electricity, and there are shops in the park selling cold beer. What more could you want? 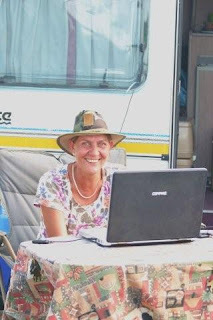 We like to think of ourselves as Kruger regulars, but our experiences pale into insignificance when you consider that Martie Goddard, who is camping near us in Malelane Camp in the south of Kruger, is spending A WHOLE YEAR in Kruger. She’s traveling solo in a caravan. She is, in her own words, living her dream. Martie is also writing a blog, and unlike me she actually does have a LEGION of fans. Last month, Martie had 132,000 hits on her blog, and this month she’s hoping for 150,000. I won’t tell you how many hits I get a month, but suffice it to say, I would be a very happy man if I had nearly as many hits on my blog as Martie has on hers, and if as many people read my books as read Martie’s blog I would be a very rich man. Martie has become something of a celebrity here in the park, and has been interviewed on national radio. You can read Martie's blog, in which she posts pictures of interesting animal and bird sightings on the South African National Parks' website here. While cooking an extraordinary dinner for Mrs Blog and me on her braai (barbie), Martie agreed to be interviewed by me on the eve of her 171st day in Kruger. TP: Who is Martie Goddard, in 25 words or less? MG: Let me get a beer first. I’m 45 years old, South African, with two children, Megan and Carmen, aged 25 and 21. Megan teaches children with special needs and Carmen is in her final year of wildlife management studies. I’m married to Stephen and we live in Doha in the Middle East. We’ve lived there for 11 years. Isn’t that 25 words already? TP: Yes. Why are you spending a year in Kruger? MG: I always tell people life is too short not to do what you really want to. If you come here for five, 10, 15 days, it’s never enough. So why not a year? Here I can bring Kruger to people who can’t come here, and there are many people in the world who know about Kruger, but don’t have the means to get here. Even in SA there are people who might never be able to come here. TP: So it’s not just the world’s longest holiday? MG: No. My husband says it’s not a holiday. That’s why I can’t have a beer at 7 in the morning. He says this is my job – and writing my blog. TP: What did Stephen say when you told him you wanted spend a year away from home? MG: A few months before we left, he sat me down and said, ‘you know what, we’ve never actually discussed you going!’ At first he didn’t believe I was going to do it. Then I got a second job, teaching English in Doha (at the moment Martie’s main job is as the PA for an investment company). I taught English in the evening in order to fund the trip. I think Stephen only realised it was serious because I messaged him to say it was 40 days until I left. A lot of people probably thought I would go for a month, three months or six months. Maybe I didn’t think I’d make the whole thing, but I’ve always been someone who will see something through. TP: What’s the longest period you’d spent in Kruger before this. MG: 14 or 15 days. TP: Why Kruger – why not travel around South Africa or some neighbouring countries for a year? MG: Apart from going to the Masai Mara I’ve never wanted to go to other game parks. Maybe one day I’ll go to the Okavango (in Botswana – scene of my next novel, TP), but to me there is no place like Kruger. TP: What makes Kruger so special? MG: Every day is different. No day is ever the same. The facilities here are great, and I feel safer in Kruger than what I would in Joburg, Cape Town or Durban. I’ve never worried about going to bed at night. TP: You feel safe, that’s good... but what’s been the scariest thing that’s happened to you the last 171 days. MG: I got chased by an elephant between Letaba and Phalaborwa. There were people parked looking at something and I drove up to them. The guy said ‘there’s an angry elephant’. I’ve never been scared of elephants and I saw this one grazing. I drove past and as I got next to him, about 25 metres away, he started running. He was breaking every tree and branch in front of him to get to me, so I reversed the Slug (the Slug is Martie’s bakkie/pickup) at about 100kph! The elephant kept coming. All I could do was just shout. At that point I shouted in Afrikaans: “Stop jou donder!” (stop you thunder – it’s like a swear word, but not that bad). TP: What’s been your happiest moment in the past 171 days? MG: There have been so many. I’ll have to think about that one. Every day is happy. TP: Do you ever get sad or lonely? MG: I don’t get lonely, but I do get sad. I speak to thousands of people every day through the blog, by email, and the people I meet in the park, but I do get sad and I miss Stephen, and I think that’s just natural. TP: Just on that point, is this a good thing or bad thing for a relationship, or does it depend on the relationship? MG: It depends on the relationship. But Stephen flies for a living so he’s away from home quite often. This (with me being away) gives him the opportunity to blow the house down with his stereo speakers and his music. He says he’s blowing the cobweb out of the Bose!. TP: How hard is it camping by yourself? MG: In the beginning it was very difficult, because I didn’t know how to do things. Stephen came with me (for the first 10 days) and showed me how to tow a caravan and set it up. He showed me how to tell if the caravan was level, but then when it came to showing me how to put up the caravan’s tent he didn’t know how to do it! We had to get someone to show us how to do it! It was quite funny. Stephen bought the man who showed us a bottle of whisky. He told me after that to only ask the women in the campground for help, and not to buy a bottle of whisky for everyone who helped me. I met some nice people at Letaba, John and Norma, and gave me a checklist to go through before I pack up and set up the caravan. I still SMS John sometimes for advice and I got a message today from Norma saying he worries every time I have to move. Now, though, camping’s a piece of cake. TP: Your blog is very successful. Did you ever think it would take off like this? MG: No. When I left, I said to Stephen. if only one person reads it I’ll be happy. If one person got to be closer to Kruger because of the blog I’d be happy. TP: What’s the oddest thing you’ve been asked by someone on the blog? MG: People ask me to find animals and post pictures. Someone asked me to find a meerkat, but I told him I’d have to drive for days to find one (there are none in the Kruger Park). Someone else is waiting for a dung beetle, so I’m waiting for the rains to come so I can take a picture of one. MG: I don’t have one. I like them all. MG: I’ll go with my husband on this one, because he thought it was so rare when he first saw one: the lilac breasted roller. When I started seriously into birding I realised this was one of the most common birds in Kruger! TP: Are you the luckiest person in Kruger or the craziest? MG: I think I’m both. TP: Could you live here full time. MG: I think I could do the blog for a year, but not full time. Without the blog I would have been bored, and lonely. The blog takes a lot of my time, but I couldn’t do it forever and live like this forever. TP: What’s the best thing about living in caravan as opposed to living in a house or flat? MG: Sheesh, no man, living in a house is much better than living in caravan! TP: Let me ask that question another way… what do you miss most about living in a house? MG: To have a full bathroom; and to have a nice couch and fully equipped kitchen. However, I do like cooking on an open fire. TP: What’s the one gadget you’re really pleased you bought or brought with you? MG: It was actually a gift - an ice maker. Beer has to be cold. TP: What’s the most useless thing you bought? MG: The storm straps for the caravan awning - they were so short. People told me I had to have storm straps (broad nylon straps that stop a caravan’s awning blowing away), so I bought six of them, but they were all too short – only three metres long! TP: What advice would give someone going on a long camping or caravanning holiday by themselves? MG: I’m not an expert and I’m still learning most of the way. Take every day as it comes. Enjoy what goes wrong, as well as what goes right. TP: What’s the most touching or memorable comment or email you’ve had from a reader? MG: A woman emailed me to say she used to come to Kruger with her husband, but he had passed away. She’s over eighty and because her husband liked Kruger so much, she scattered his ashes at Pafuri picnic site (in the far north of the park) under the big sycamore fig. Unfortunately the tree was uprooted in the 2000 floods and washed down the river into Mozambique, so she told me her husband is now floating in the Indian Ocean somewhere. Her sense of humour was fantastic. TP: Would you do all this again? MG: Yes, I’d do it again. I don’t know if my husband would allow it, but I’d definitely do it again. I enjoy it, and I love the different things I see each day. Also, once I’ve been in Kruger for nearly a year, how could I just come back for five or 10 days? TP: You’re seeing Stephen in 12 days time (he’s flying out to meet Martie for some mid-trip R and R) What’s the first thing you’re going to say to him? MG: Engel, (this is Afrikaans for ‘angel’, not fridge, which is what I thought), I miss you and I just want to touch you, you are real! After reading that only have 52 sleeps to go as now cant sleep for the rest of the night and will just sit and dream of Africa, cold beer and angry elephants. I would like to thank both you and Mrs Blog for coming around last night..It was a real pleasure to meet you and see the man and (woman) behing the most amazing books you are writing! Thanks for the interview..you really had me thinking about some of the questions? Again, I hope to meet you and SO again during your travels and I cant wait to read your new book "Ivory"! That was a wonderful interview Tony (& well worth missing out on one of Martie's blogs that night - hope you didn't get lynched). I have been following her blog daily for the last few months & it's just wonderful, so too are her photos ! Spot on Tony, I've been following Martie's blog for most of the year (except when we were in KNP - and missed meeting her for real!! :( ) and it's excellent to get a "different" view of what she is experiencing. I hope you had a wonderful trip !! Thanks for interview with Martie I am one of the many who is "addicted" to her blog but will forgive you for keeping her the other night she is a super person had the pleasure of meeting her in Sept even though only fleetingly. Just a mention here Martie gave a web site where your books can be ordered and my daughter says when she went onto the site it redirected her to a site that was chinese (are you aware of this? )she has now ordered through a book shop and we cannot wait to start reading. Thanks, all, for the comments, and thanks for the heads-up re my website Mellory. I'm just fixing the problem.